Thanks to our customer E.B. 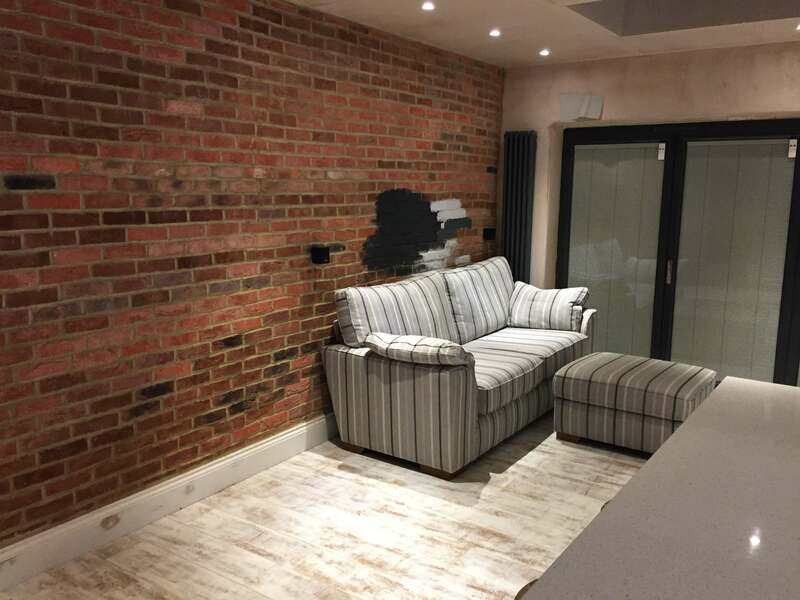 we can show you painted brick slips on a completed project. Our project was inspired by a pic we saw on your blog and it turned out really well. We painted the clearance brick slips and the result was stunning as you can see. They also looked great in the red brick and we were tempted to leave them, but they didn’t really go with the rest of the kitchens colour scheme. Yes, we are well pleased with how it’s all turned out. We actually undercoated the brick slips in white before going for the dark colour, (which incidentally is Farrow and Balls ‘Railings’) and it looked good in white too. 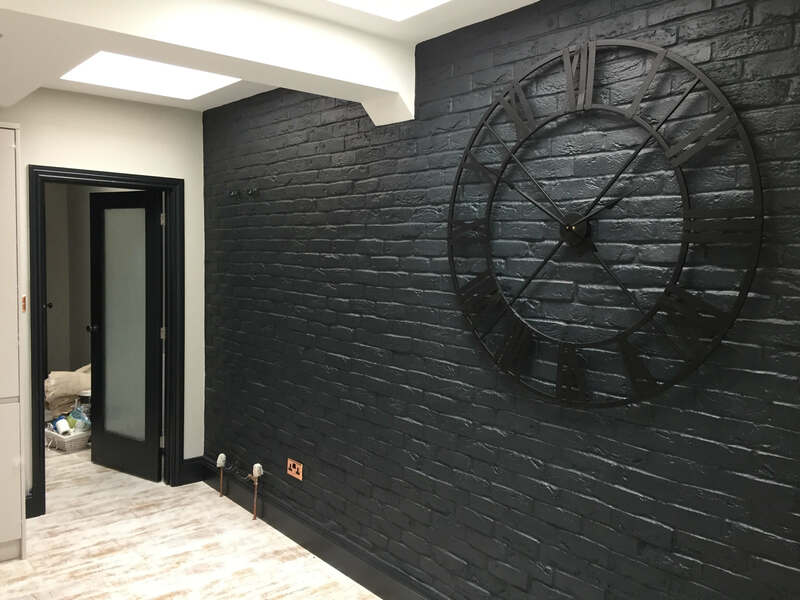 We were actually nervous of painting it as the red brick mix before we painted them white created such a lovely effect, but overall, we think me made the right decision. Without wishing to sound too negative one of the things the builder struggled with was the differing widths of the slips when putting them up. Don’t know whether he was trying to make the job sound more complicated than it was, but he said it was a bit of a pain. It did however give the final look a more rustic feel which is what we wanted. They were also tough to paint. It took me most of the day to paint the white on. We had a painter do the final coats and it’s definitely a job for a big thick brush rather than a roller. It’s also best to work a few bricks at a time he reckoned, finish those and then move on. Either way it takes time, but the finish makes it all worthwhile. 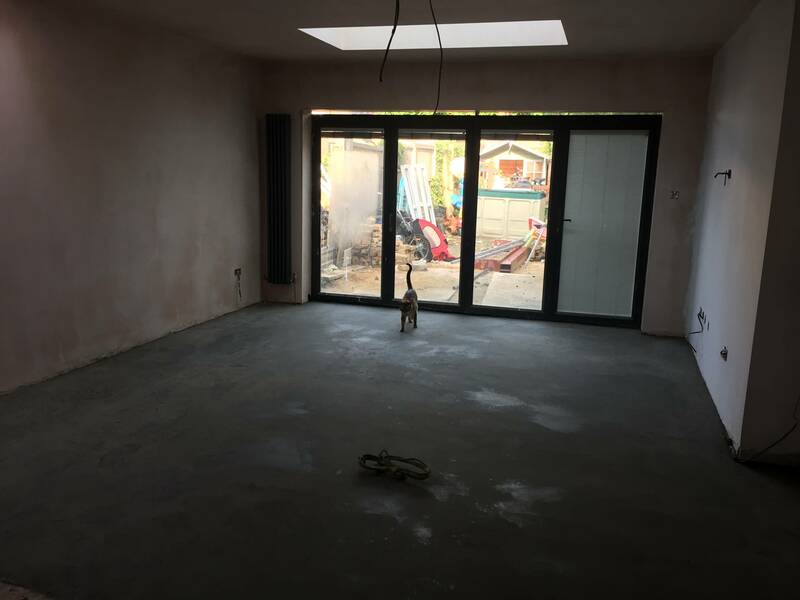 As for our experience with Higgins Cladding the product was exactly as described and we were very pleased with the deal you gave us. We were originally going to buy brick tiles for double the price, but you persuaded us these would be just as good and authentic looking, and you were spot on. Every now and again our factories produce a manufacturing run and the colour match comes out incorrectly. These coloured 2nds are still quality slips but generally you will receive a mix of colours in your order. Brick slip clearance sales allow customers to purchase our brick slips at a reduced rate. In our experience customers that have purchased clearance brick slips do so with a view to painting them after pointing. 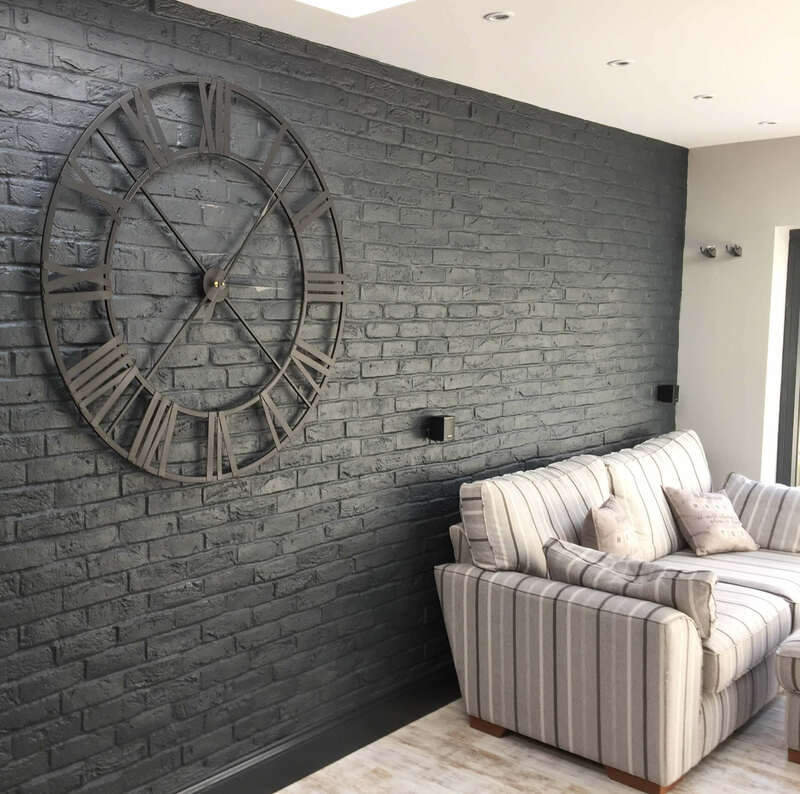 Perfect for painting our cast clearance brick slips are manufactured in the UK and once installed give the appearance of a rustic hand laid brick wall.